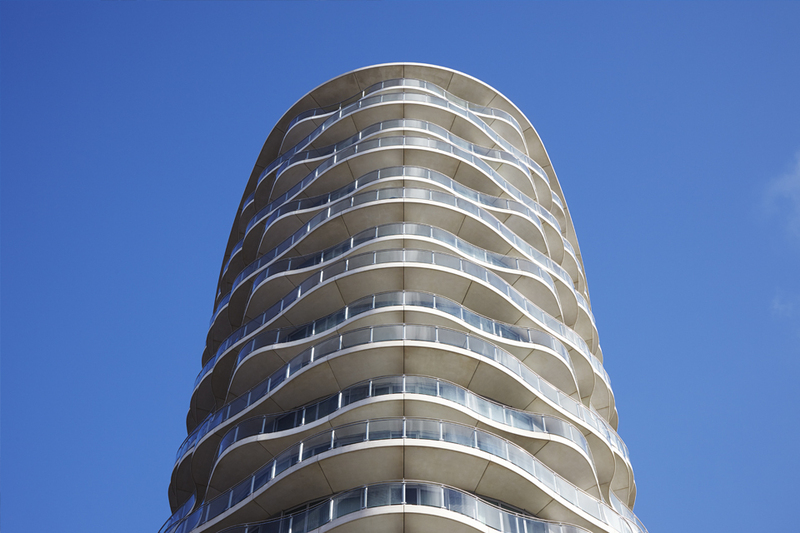 CZWG has sculpted two towers of undulating concrete balconies in east London. 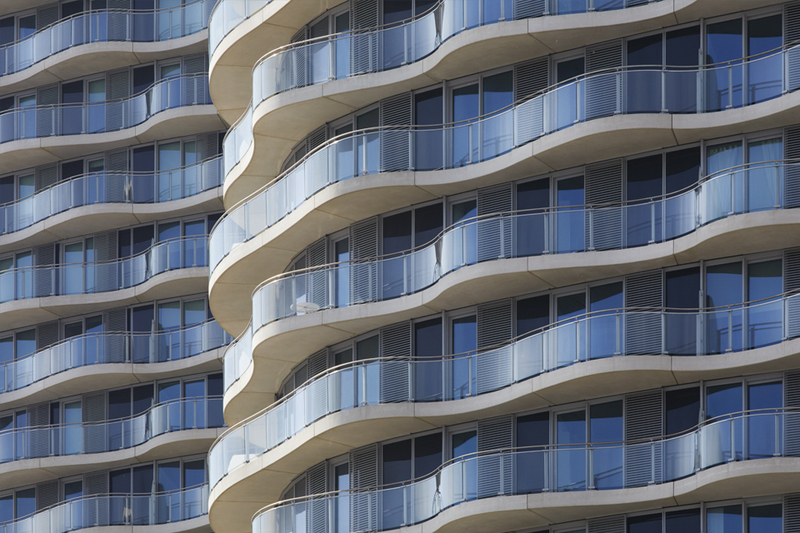 The balconies ripple around the floors of the two towers, which have recently been completed and are situated in London’s docklands. Concrete is integral to the two buildings. To ensure the precast-concrete balconies were exact and free of blemishes CZWG worked hard to perfect their detailing. This included ensuring that the joints between the balcony sections lined up perfectly over the full height of the building. There is a lot of repetition in the precast elements: each balcony is symmetrical, the balconies on every other floor are identical and they are mirrored either side of the building.“Varying and staggering the balcony widths ensure every apartment can enjoy a usable outdoor space that is not immediately overshadowed,” explains Rex Wilkinson, a partner at the project’s architect, CZWG. Wilkinson says the white concrete of the balconies had to be flawless. “If you’re looking up at these buildings from below or simply looking upwards from one of the balconies then, boy, does your elevational material have to be immaculate, which meant using precast concrete,” he explains. The glass for the post-mounted balustrades was fitted by the supplier in Northern Ireland and is curved to precisely follow the balcony edge. “One of the nice effects of using curved glass is that it does not reflect light in the same way that flat glass does, so the balustrades appear transparent and, when the sun casts shadows of the balconies onto the facade, it has the delightful effect of making the facade itself appear rippled,” says Wilkinson. A concrete core forms the structural backbone of each tower, and this supports oval, in-situ concrete floor plates and the glazed facade at their perimeter, along with the distinctive precast concrete balconies. “These buildings are all about combining concrete with glass to create a great look,” explains Wilkinson. 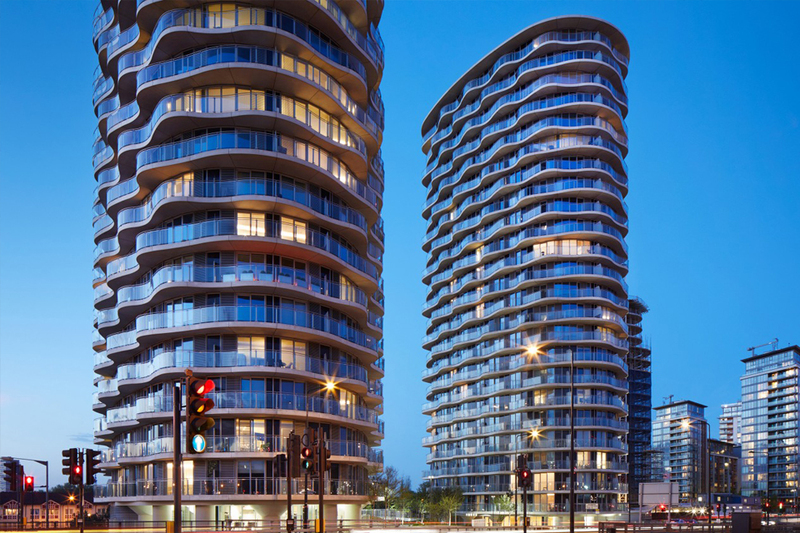 For the towers’ residents, their beautifully crafted balconies offer views out over the Royal Docks, the Thames, the O2 arena, the Olympic Park and Canary Wharf with the skyline of the City of London as a backdrop. Residents will also be able to see the nearby ExCel Exhibition Centre, with which Hoola enjoys an innovative energy sharing agreement that allows it to use excess heat from ExCel’s combined heat and power plant. This low - carbon heat source has ensured the £90m scheme generates 57% less carbon than is permitted under the 2010 Building Regulations.